Time for an updated Texas flats fishing report. We are wrapping up the second, and lighter, week of Spring Break around here. Still a busy week, but still much more mellow than last week. But tomorrow will bring that to a close, and things will return to normal down along the Texas Coast. So here is a recap of what we’ve been seeing this week, and what we hope to see out there next week as well. Our week started out with a bit more of the same. Cloudy, a little wind, blah blah blah. Not terrible, but still not feeling like Spring in South Texas really. We were able to get out there and find some fish each day, but it was still on the tougher end of the spectrum. Many still laying up, but a few tails and cruisers to shoot at. Thursday was the big break in the weather we had been waiting for. For the first time in far too long, we had nothing but blue skies and sunshine from start to finish. Definitely a welcome change. With the sun shining, it was awesome to be able to spot fish easily. Seems like we’ve been working awfully hard out there lately, just to see ’em swimming around. So what a change of pace for all involved. With the sun beating down on the water, our water temps were in the 64 degree range on most of the flats we were fishing that afternoon. That’s a far cry from the high 50’s and such we’ve been dealing with lately. And the fish certainly seemed to like it as well. While the morning started a bit slow, as the sun got a bit higher, the fish began moving around. At one point, after searching the better part of a lake in Corpus Christi Bay without seeing a thing, we bumped into the fish. In fact, we bumped into all of them. We ended up poling through, and surrounded by, a school of 500 or more reds. All moving upwind together across the lake. Unreal! Aside from the massive school of reds though, the fishing under the sunnier skies has been a vast improvement. Plenty of fish moving around the past few days. You’ll see a ton of singles, some pairs and a good number of schools in the 4-6 range. All are moving around, looking for food and very much willing to grab a fly. A few have tailed for us. But not in any great numbers just yet. But a good number of our shots have been ridiculously close to the boat. Some in the 10′ range even, as the fish are completely preoccupied with digging for food, instead of looking for boats. God bless a happy redfish! We’re still waiting to see the schools of 15-30 fish aggressively moving across the flats. Tailing so aggressively, that you can often get two or three fish out of a single school. But those will be here any day. As the water continues to warm, the fish will continue to ramp up their feeding habits. So we are looking forward to more schools, tails and topwater eaters here in the very near future. Our water remains pretty high around here. Not crazy high, but a touch maybe. It’s actually a really fun level. Plenty out there to get into most spots you want to fish. Yet not too deep to fish across the middle of some of the usual lakes and flats we love to fish. 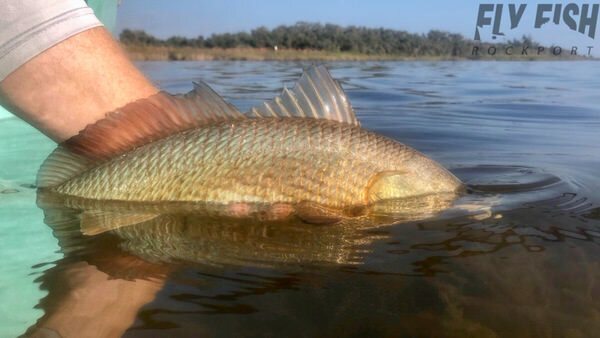 But there is enough out there that the fish are swimming up in the grass, under the edges of the mangroves and all those other redfishy type spots that are fun to fish. Our fly selection has been fairly standard. Black crab patterns have gotten smoked by every fish we got them in front of. The Billy Ray and Swamp Thing have been a favorite as well. Tan and pink Chug Bugs have moved fish on the surface pretty well. And when we start seeing all the schools of sheepshead roaming around the flats, smaller shrimp patterns have turned the most fish. Mainly though, the fish just want to eat. It’s warming up, there is an abundance of shrimp, crab and baitfish in the water, so they are just getting happy and loading up on calories. So pretty much anything presented well, should get gobbled up. It looks like we are finally going to get our Spring weather to stick around here for the foreseeable future. This coming week is looking great with predominately sunny days, easy winds (for Spring) and temps in the 70’s each day. Overnight lows will also be warmer, in the 60’s, which will really allow our water to warm a bit more. So we are expecting the fishing to get stupid good here any second. We are out on the water every day this week, with boats running all over the place. So we will keep kicking out the reports as we are fishing from Port O’Connor to Baffin Bay this coming week, and everywhere in between.